Chronic pain flares are hard. Practice these 21 strategies to make them just a little easier. Get the Grief Out. Have a good cry. Let yourself be sad. Don’t put on a positive act right at the beginning. It is normal and healthy to feel upset when bad things happen. Find ways to get out the grief by journaling, talking, creating art, listening to music, and allowing yourself to feel whatever you feel. Make a Plan. You need a practical and solid plan. The best way to create one is to write it down. What steps do you need to take over the next days and weeks? What reasonable and helpful goals can you set for yourself? What do you need to avoid? Set Boundaries and Reduce your Schedule. Pain flare ups require rest. There is no way around this. Finding time to rest requires reducing your schedule and setting strict boundaries on what you will and will not do for a while. Cancel plans. Take a day off. Ask someone to take over a responsibility. Let the house get dirty. Do whatever it takes to get some extra rest. Say no, and don’t feel guilty. Take a pacing class to learn how to better balance between movement and rest. Improve the Moment. Continually ask yourself, What will make this moment better? Ice? Heat? A bath? A meal? Massage? Rest? Walk? Hydrating? Stretching? Reaching out to a friend? Taking pain meds? As much as you are able, don’t sit in your misery when you can do something, no matter how small. Be Honest About What You Need. Asking for help is important. Instead of pretending you are fine or not telling anyone about your increase in pain, have an honest discussion with the people close to you. Let them know if you need help with tasks you typically take care of. Be honest about what you absolutely can’t do for awhile. Shut Down Guilt and Regret. Those thoughts that the flare-up is your fault and that you could have avoided it if you had done x, y or z? Shut. Them. Down. It’s not your fault. Your body is wonky. It does what it wants when it wants. While you do have a measure of control over your health, for many people, flare-ups are simply unavoidable. Rework Your Expectations. Expect less out of yourself and from life for a while. Accept that things will be a little harder for the time being. Talk Yourself Down. Tell yourself the truth about your situation. Avoid spiraling into untrue and unhelpful thoughts. Flare ups pass. You have done this before and you can do it again. You will not always feel this emotionally bent out of shape. Your body is strong and able to withstand high levels of pain. You can and will make it through each hard moment. Distract Yourself. As much as you are able, take a break from the pain through distraction. Read a book. Watch a mindless TV show. Read articles online. Snuggle a puppy. Listen to a podcast. Take pictures with your phone. Work on a craft or some form of art. Consider the Big Picture. Step back for a moment and see the big picture. What is God doing? How is he working? How has he shown up in the past? What is your hope? What good things is he providing right next to the hard things? Don’t Stop Moving Completely. Rest is essential, but it’s also important to not stop moving completely. Do some gentle stretching. Walk down the hall. Sit outside. Do a little tai chi or yoga. Know your body well enough to know what it can handle. Do Your Best Not to Isolate. Some level of isolation may be inevitable in a bad pain flare, but do what you can to limit it. Text a friend. Engage on Facebook. Ask someone to come visit. Talk to someone on the phone. Go out if and when you can. Talk to Friends Who Experience Pain. Even better than talking to people in general is talking to other people who experience pain. Vent away to someone who completely understands. Join a community for people with chronic illness and pain. Pray. Pray a lot. Talk to God about what you are going through. Ask questions. Share your pain. Thank him for the good things he has given you. Confess sins. Ask forgiveness. (Not because your pain is a result of sin, just because this is a good thing to do in general.) Wrestle with God’s plan for your life. Find comfort in his presence. Practice Relaxation Strategies. Relaxing your body is important when you are in pain. Tense muscles can prolong a flare. Practice deep breathing. Listen to a guided visualization. Meditate. Get a massage. Take a bath. Look up progressive muscle relaxation and give it a try. Remember Basic Self-Care. Have you eaten today? Have you had enough water today? Would you feel better if you changed into clean clothes? Do you need to brush your teeth? Take a shower? If you can’t shower or bathe, could you use a washcloth to get a little cleaner? Did you remember to take your meds? Engage Your Senses. Engaging your senses can be a form of relaxation and also a means of distracting from the pain. Smell some essential oils. Eat a piece of chocolate. Listen to music. Touch a cold and smooth stone or a fuzzy pillow. Sleep under a weighted blanket. Use an Online Counseling Service. There are a variety of online counseling and support services that can be used either for free or a small price. Do a google search for “online counseling” and see what you find. Practice Gratitude. Make a list of the good things God has given you. Be on the lookout for things that bring your joy. Purposefully add pleasurable things into your day. Do Something Nice for Someone Else. It can help to take the focus off of yourself and onto the people around you. Write someone a letter or card. Knit someone a scarf. Make your family member a cup of tea. Listen to a friend going through a hard time. Try Something New. Trying a new pain management technique can bring a measure of hope. Try that supplement, vitamin, essential oil, or gadget you have been considering. Make an appointment with a new specialist. Ask your doctor if there is a next step to take. Read a book on pain management to get ideas. What about you? 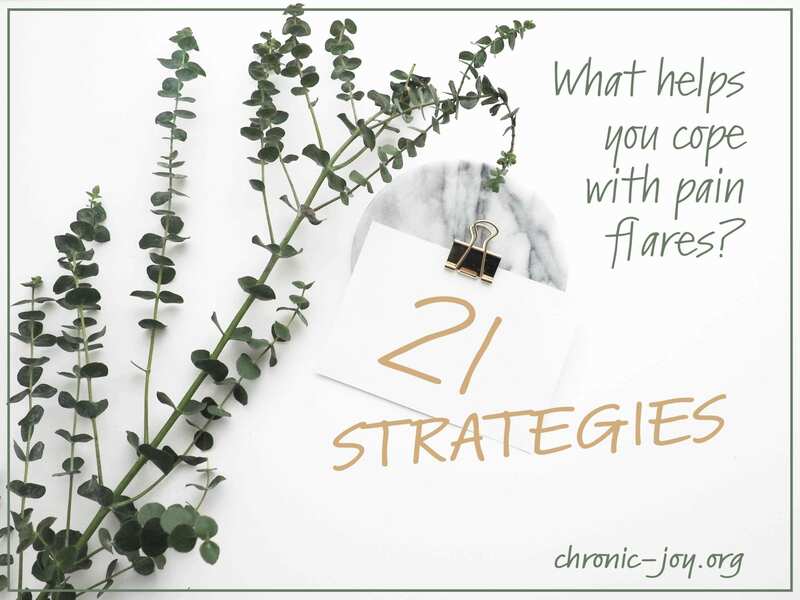 What helps you cope with flares? *First published on lifeinslowmotionblog.com on July 3, 2018. Republished with permission. Enjoyed this post from Esther? Read Serving Out of a Poverty of Health or view Your Labor Is Not In Vain from Diamonds 2019, the Living Hope Conference. 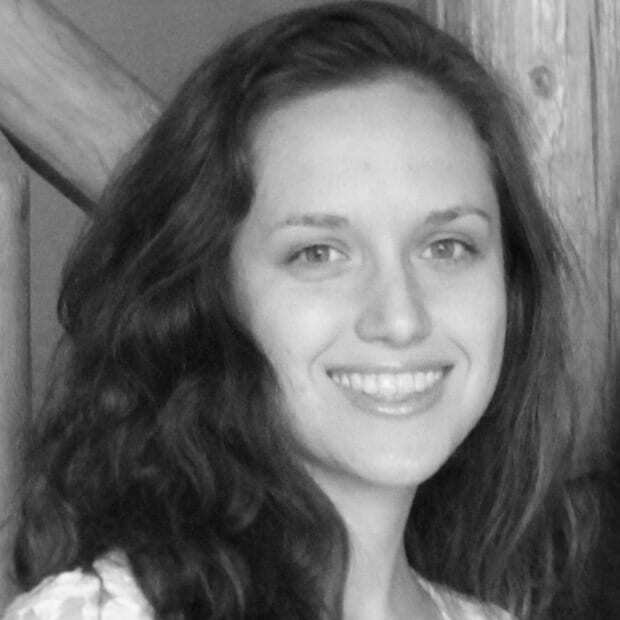 Esther is a counselor and writer who lives in Maryland with her husband. She blogs about life, faith and chronic pain at lifeinslowmotionblog.com, and also creates a variety of courses for people impacted by illness and pain. Esther is the author of two booklets. In this first booklet in the Chronic Pain and the Christian Life series, God, Wouldn’t I Be More Useful to You If I Were Healthy?, explores what it looks like to live a life of work, service and rest even when the pain doesn’t go away. The second book in the series, When Chronic Pain and Illness Take Everything Away, explores the topic of grief and loss. You can find both books on Amazon.com in print, Kindle and audio formats. Thanks for sharing these practical tips. I have been blessed by both of Esther’s books, and just knowing that others walk these same paths of intense pain flaring days is a comfort too. Perfect timing, as I am going through a Chronic Pain Flare right now. Everything you mentioned is great, I already do a lot of them while going through a bad Flare, and they really do help!! I have not tried online counseling yet, maybe something new to try. Thank you again for all the great options to try..